Google Translate is a community content translation tool that allows you (and your community members) to translate user-generated content within a CMNTY Platform. When Google Translate is activated, a flag icon will appear next to content on the front-end of your CMNTY Platform. Click on the flag and choose the flag associated with the language that you wish to translate your content to. Select Go to my console. In the project overview, you’ll create a new project. Press the Create Project button. Fill in Project Name & Project ID (it does not matter what you write there, however, it’s advised to use some obvious name to keep everything neat) and then press the Create button. Your new project will be created, and you’ll automatically be redirected to your new project overview. From the menu on left, select APIs & Auth. Click Library to see a list of all available APIs. Find Cloud Translate API and enable it by turning it ON. Click Translate API to open it. Select Credentials from the menu on the left, and then in the section called Public API access, press the Create new key button. From the modal window that pops up, select Browser key. A new modal will appear with options that let you set allowed domains for use with your Translate API. We strongly advise that you fill this in. Confirm settings by pressing the Create button. In the Public API access section, you will see a newly created entry. Copy your API key so that you can add it, later, into your CMNTY Platform settings. From the menu on the left, select Billing. The Set Up Your Billing Profile form will appear. Use this form to enable your billing profile so that you can continue with the Translate API settings in your CMNTY Platform. Open up the Admin section in your CMNTY Platform and go to: Configure > Integrations > Google Translate. Fill in your API Key. 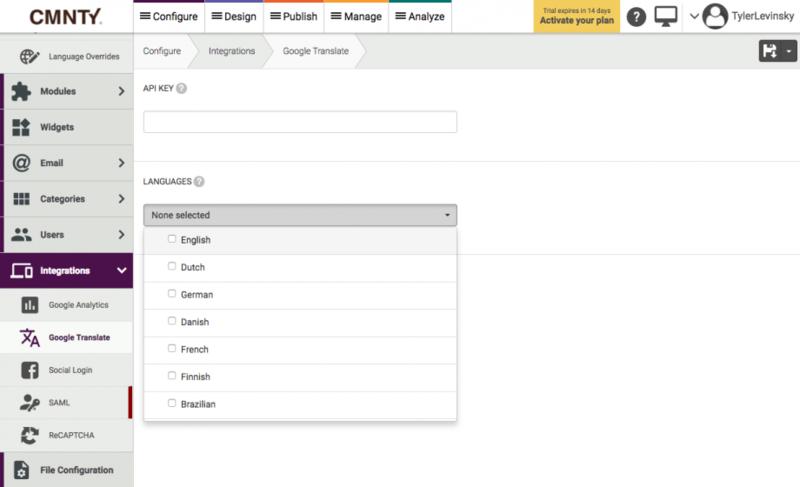 Select which languages you’d like to translate user-generated content with using the Google Translate API. Confirm everything by pressing Save icon in the upper right-hand corner. The Google Translate API is now enabled in your CMNTY Platform!